The 260-RGAI-1 Rain Gauge Analog Interface is a digital to analog converter. It provides an interface between a tipping bucket rain gauge and a data acquisition device (DAQ). 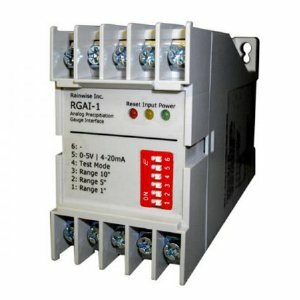 The 260-RGAI-1 Rain Gauge Analog Interface is a digital to analog converter. It provides an interface between a tipping bucket rain gauge and a data acquisition device (DAQ). It is intended for use in industrial applications, where a 4-20mA or a 0-5V analog input is required by a DAQ to accurately record rainfall accumulation. The enclosure is constructed from glass-filled polycarbonate, which will provide years of protection to the internal circuitry. The enclosure is DIN rail compatible and can be mounted to any flat surface. Weatherproof enclosures are available. The rain gauge calibration assures that each tip or contact closure is equal to 0.01" of rainfall. The RGAI-1 will accumulate the rainfall amounts and scale the output accordingly. Should the accumulation exceed the selected range, the output will reset to its minimum value and resume. A reset input is provided as way of resetting the rainfall remotely. The 24V digital input requires a short pulse from an external controller. By resetting daily the risk of rollover can be eliminated. Overall size: 4.567" x 2.756" X 1.772"